According to the American Chemistry Council (ACC), the U.S. Chemical Production Regional Index (U.S. CPRI) rose by 0.2 percent in November, following a 0.5 percent decline in October and a 0.2 percent decline in September. During November, chemical output rose across all regions except the Gulf Coast, where it edged lower. Chemical production was mixed over the three-month period. There were gains in the production three-month moving average output trend in plastic resins, adhesives, pesticides, coatings, fertilizers, consumer products, and synthetic dyes and pigments. These gains were offset by declines in the output trend in organic chemicals, synthetic rubber, manufactured fibers, chlor-alkali, other inorganic chemicals, and other specialty chemicals. Nearly all manufactured goods are produced using chemistry in some form or another. Thus, manufacturing activity is an important indicator for chemical production. On a three-month-moving average basis, manufacturing activity was flat in November, following a 0.2 percent gain in October. Output expanded in several chemistry-intensive manufacturing industries, including appliances, aerospace, machinery, fabricated metal products, semiconductors, petroleum refining, iron and steel products, foundries, plastic products, rubber products, tires, and furniture. Compared with November 2017, U.S. chemical production rose 4.2 percent on a year-over-year basis. 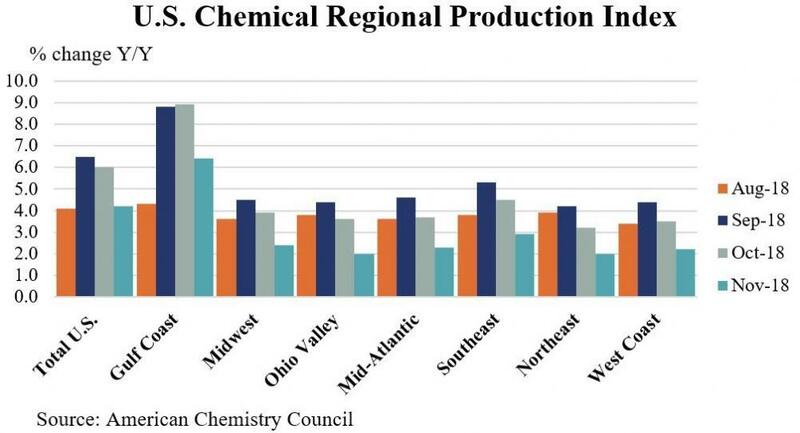 Chemical production was higher than a year ago in all regions, with the largest gains in the Gulf Coast. The chemistry industry is one of the largest industries in the U.S., a $526 billion enterprise. The manufacturing sector is the largest consumer of chemical products, and 96 percent of manufactured goods are touched by chemistry. The U.S. CPRI was developed to track chemical production activity in seven regions of the U.S. The U.S. CPRI is based on information from the Federal Reserve, and as such, includes monthly revisions as published by the Federal Reserve. To smooth month-to-month fluctuations, the U.S. CPRI is measured using a three-month moving average. Thus, the reading in November reflects production activity during September, October, and November.